Pathfinders begins the necessary process of documenting early digital literature, specifically pre-web hypertext fiction and poetry, from 1986-1995. These literary works were produced with programming languages like BASIC or authoring systems like Storyspace and HyperCard and require a degree of interactivity between the reader and the work. They were also among the first computer-based works of literature to be sold commercially in the U.S. and, because of their availability through commercial distribution, were influential in shaping literary theory and criticism that, today, are used to discuss born digital writing. They are also literary works in danger of becoming inaccessible to the public because they were produced on and for computer platforms that today are obsolete. We chose these four because they are long-form works that represent a specific individual contribution unique to the field as well as reflect a wide range of experimentation taking place during this period. For example, Malloy’s Uncle Roger, the first commercial work of electronic literature to be sold in the United States, was first published in 1986 as a serial novel delivered to an online audience on the Whole Earth ‘Lectric Link (WELL). Later iterations expressed on floppy disks and the web speak to its enduring popularity and give rise to its status as a classic work of the period. John McDaid's Uncle Buddy's Phantom Funhouse was produced with HyperCard, a software application available on Apple computers for creating hypermedia. Like Malloy's Uncle Roger, Funhouse is a novel, but one that includes sound and printed elements as part of its storytelling strategy. 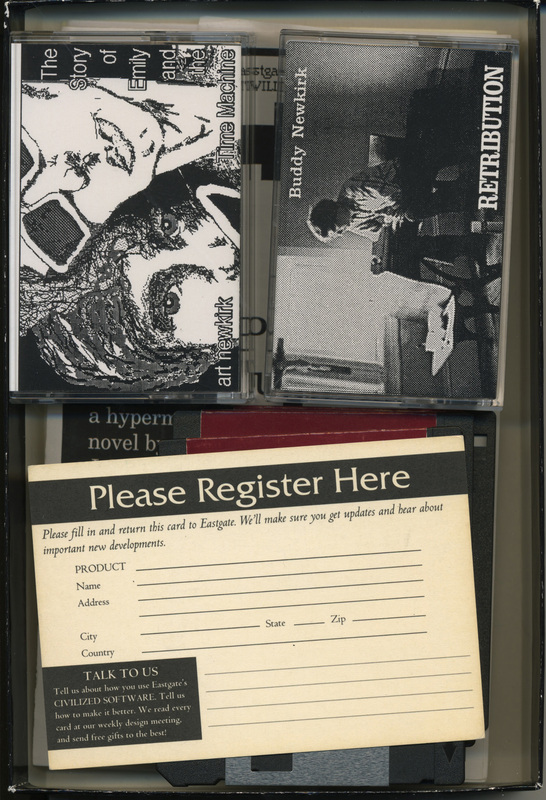 Shelley Jackson's Patchwork Girl, produced with Storyspace––a hypertext authoring system created and sold by Eastgate Systems, Inc. ideal for long-form, complex writing––is viewed by many as the high point of hypertext literature in the pre-web period of the early digital age. Its recent re-release on flash drive, 20 years after its first publication, demonstrates its on-going status as an important work of contemporary fiction. 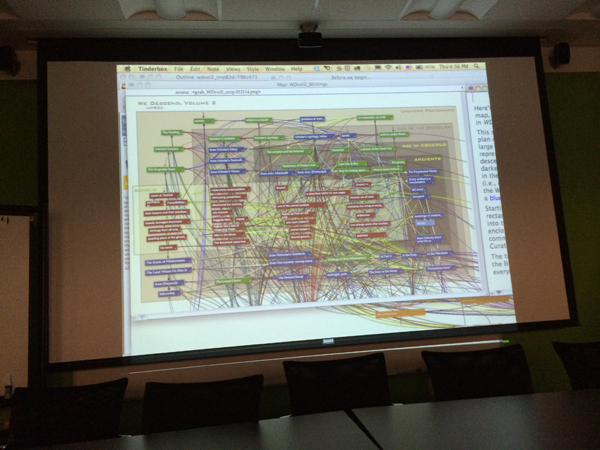 Finally, Bill Bly's hypertext novel We Descend, also created with Storyspace, takes advantage of the affordances of this tool to experiment successfully with the multi-temporal narrative and intricate narrative structure. 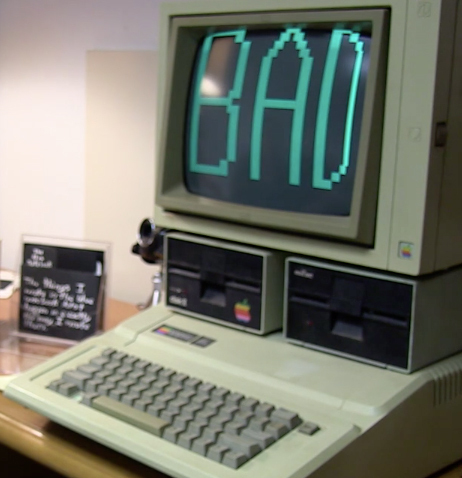 Our method of documentation is unique in that we videotaped each artist and two additional readers interacting with a work on its original computer platform––a methodology we call “traversal.” When watching the traversal for Uncle Roger, for example, scholars can hear the crackle of the Apple IIe as it boots up and see the words “Bad Information” appear a few seconds later on the screen. Neither of these two elements is part of the story, but they are important cultural and artistic features lost in the migration to the web version that came later. Traversal recordings also capture the musings of authors about intentions, circumstances of writing, and on some occasions, effects that no longer work as intended. We see our work with documentation as a form of digital preservation, one that builds on the method of “collection,” as opposed to the other two more common methods, “migration” and “emulation,” by providing scholars wanting to experience the work in its original format access to video documentation of the works in performance on a computer with which the work would have been originally experienced. Besides videos of traversals, Pathfinders also includes videos of interviews with the artists and readers of the four main works; photos of physical artifacts such as floppies, folio covers or boxes containing floppies and other media; sound files from traversals and interviews; and commentary about the works and media. For example, John McDaid’s Funhouse consisted of five floppy disks packaged in a black box. Nowhere is it documented that the box also contains two music cassettes, a paper copy of a short story marked up by an editor, and a letter from the editor. All of these additional materials also make up the Funhouse and, so, are crucial to one’s understanding of the work. Pathfinders provides a video of McDaid opening the box and discussing each item found inside; certainly, an experience that scholars will see as helpful for understanding the breadth of McDaid’s vision. In total, Pathfinders features 173 screens of content, including 53,857 words, 104 video clips, 204 color photos, and three audio files. In developing the project, we have striven to provide information helpful to scholars. Publication dates, versions, production methods have been vetted by publishers and artists when possible. Thus, we hope to clear up discrepancies relating to this information as well as offer information previously unknown about these works. Judy Malloy's Uncle Roger serves as a case in point. While many scholars know that she published "A Party in Woodside" in 1987, they may not be aware that she updated and republished it in 1988. Nor it is well-known that the Modern Museum of Art holds a copy of the 1987 version of Uncle Roger, numbered "no. 10. ", a fact highlights the work's status as a recognized work of art. With the traversal videos and ensuing author interviews, we attempted a first cut at an oral history of early electronic literature. This effort yielded several notable insights, such as Judy Malloy's description of online interactions with her audience during the composition of Uncle Roger, Shelley Jackson's acknowledgment that the origins of Patchwork Girl owe something to Avital Ronell as well as George Landow, John McDaid's description of Funhouse as an attempt to "write a novel no 20th-century novelist could write," and Bill Bly's revelation that his work on We Descend has continued beyond Storyspace into the Web and other environments. This open-source, multimedia book, is funded by The National Endowment for the Humanities through a Start Up grant from the Office of Digital Humanities. The NEH support made it possible to work directly with the artists, develop the materials for this book, and create this book for open-source access. Without the assistance from the NEH, Pathfinders would not have been possible. Many other individuals and organizations provided support for our research. From the Creative Media & Digital Culture Program at Washington State University Vancouver: Madeleine Brookman served as Grigar's research assistant and was funded through fellowships and grants provided by Washington State University. She was responsible for final edits for and the management of all of the videos found in the book, the production of the Pathfinders trailer, and uploading, tagging and describing media for the book. We acknowledge the videography of Aaron Wintersong and early organization by Amalia Vacca, who served as Grigar's first research assistant and who helped to organize the traversals and interviews. Greg Philbrook provided tech support for most traversals and interviews. Will Luers, faculty member in the CMDC leading its digital publishing initiative, is responsible for the design and styling of this book. From the English Department at the University of Wisconsin-Milwaukee: Brian Keilen and Rachael Sullivan, both doctoral students, worked with Moulthrop to catalog the raw video and audio files, construct first cuts of the traversal videos, and assemble static graphics. The Digital Humanities Laboratory in the Golda Meir Memorial Library at UWM provided work space and equipment for this effort. We thank the Electronic Literature Organization for its leadership in developing methods for evaluating quality of “digital” creative and critical works and its insights into cataloging its growing body of “digital” fiction, poetry, and other literary forms––activities from which this research grows. We owe special thanks to Dean Anne Balsamo of the New School of Public Engagement, who brought together the two incipient strains of this project, and to Noah Wardrip-Fruin of the University of California Santa Cruz, whose 2012 Media Systems Workshop set the scene for that crucial conversation. We appreciate the support of Tara McPherson, Erik Loyer, and others at the University of Southern California's Alliance for Networking Visual Culture for the development of the Scalar platform on which the book is built. We thank Matthew Kirschenbaum and the Maryland Institute for Technology in the Humanities at the University of Maryland College Park for sharing The Bly Collection with us for our project. We particularly recognize Grigar’s Electronic Literature Lab at Washington State University Vancouver, which provided access to her collection of computers and works, without which the project would not have been possible. We thank Mark Bernstein of Eastgate for taking the time to answer questions about publication dates and packaging, as well as giving us access to images needed for the book. We also thank the Modern Language Association for allowing us to exhibit our Pathfinders research at the 2014 conference in Chicago. Finally, we thank the four artists who provided their time and insights into their work. They all shared so much of their knowledge, history, insights, and time to this project. Literary history is better for it. The development of this project is documented at the Pathfinders blog managed by Grigar. Also of note is the Pathfinders YouTube channel where rough cuts of videos were made available, early on, for scholars to use for their research and the curated Vimeo channel where all videos are now hosted. The exhibit, mentioned previously, that showcased these authors and their works as well as contemporary expressions of experimental writing at the Modern Language Association's 2014 convention, is archived at Pathfinders: 25 Years of Experimental Literary Art. The exhibition ran from 9-11 January and was curated by Grigar and Moulthrop. Literary scholars were able to preview the videos and photos developed for the project and access some of works on Grigar's vintage computers, though it should be noted that three of the computers shipped to Chicago were destroyed en route to the exhibit. Though we mourn their loss, it represents exactly the calamity our work of preservation is meant to address. Finally, we are already thinking ahead to an independent book project, Traversals, that further explores the uses of preservation for digital writing, and to the next version of Pathfinders that will include Moulthrop's Victory Garden, an afterword by Joseph Tabbi, and possibly transcriptions of the traversal videos for each artist. In a word, we see this project as one that will continue, adding artists and their works and capturing important information that needs to be documented for posterity.